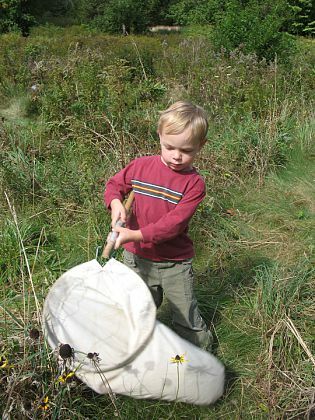 Studies have shown that children are increasingly less aware of what can be found in their own backyards. Nature-deficit disorder in children is becoming a hot topic and naturalist programs are increasingly being offered to preschool-aged children. If you are considering a nature preschool, read Last Child in the Woods by Richard Louv. Louv provides specific examples of how children are disconnected from nature. Structured and unstructured play allow for real discovery. Attending a nature preschool contributes to the overall healthy growth and development of children through daily explorations that build valuable skills such as observation, experimentation, and sorting. The observations and discoveries that children make allow for both individual experiences and group sharing. Daily walks help to establish early habits of physical fitness. My son attended the Nursery School Naturalist program at Mass Audubon Habitat Belmont, MA when he turned 3 years old and Mass Audubon Drumlin Farm Community Preschool in Lincoln, MA. A Sea School in Mystic Connecticut! On a trip to Mystic Connecticut we found this very special preschool!! The Denison Pequotsepos Nature Center opened the first nature preschool in the region in 2006. Located in Mystic, Conncecticut, this preschool offers a "living classroom" on its 300-acre wooded preserve.